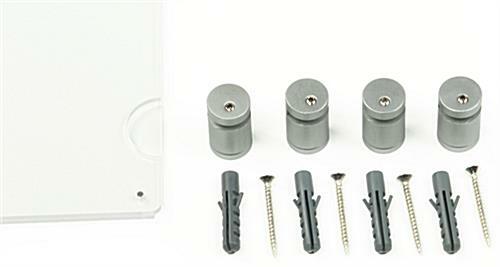 Standoff signs include (4) satin silver anodized aluminum edge grip standoffs for wall mounting. Acrylic panel has a foldover design with magnets for keeping the top closed. 22" x 28" Prints fit into the top-loading frame quickly and easily. These standoff signs, called acrylic panels, feature a satin silver anodized finish on the aluminum supports. 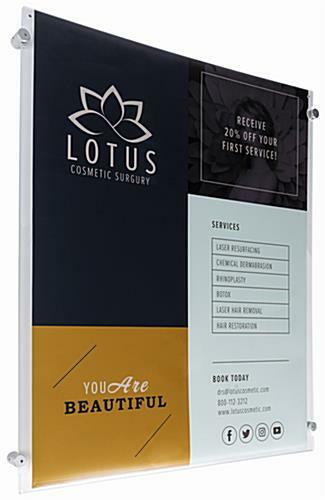 This wall mounting sign display includes an acrylic panel that can hold any type of paper. These standoff signs are made for displaying (1) 22" x 28" print. This is a great size to attract attention even in high traffic areas. These standoff signs accommodate posters in portrait format only. Each poster holder is designed for displaying on a wall. These advertisement holders are standoff signs with mounting hardware included for customer convenience. See the instructions below for details on how to hang the acrylic panel on a wall. 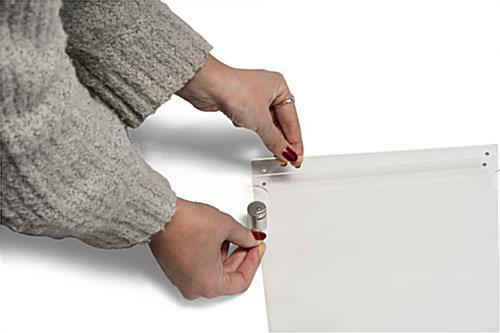 These poster holders with the mounting hardware are standoff signs that have magnets on the top of the acrylic panels to hold the unit closed. This advertising display is made for easy updates. Users can switch out the signage in these standoff signs without having to take the unit off the wall. 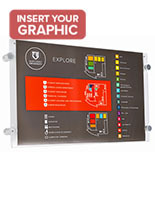 This acrylic panel is a great choice for communicating with patrons in a business. These standoff signs that are inexpensive are ideal for any type of business. Each sign display is primarily used for sales flyers, menus, promoting new fashion lines, and more. 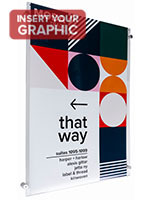 These poster displays are standoff signs that are great for high-end stores, as well as food venues, colleges, and lobbies. 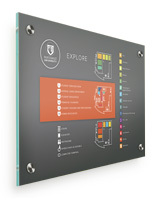 The acrylic panels can display a sign in any indoor establishment. 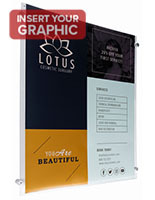 The poster holder with wall mounting hardware inexpensive for any sized advertising budget. Please Note: The uppermost pocket on each side has an open back design. 23.9" x 28.1" x 1.3"
Nice product, clean contemporary, fresh look. The only drawback is that the magnets at the top of the frame to keep the top part closed seem weak and were not able to keep closed when we put our poster in. However, our poster was printed on heavier card stock, hence that may have kept the top from closing properly. Thank you for the insightful review, Rob! We appreciate the time you took to send us your feedback. Sign holder looks very professional. Easy to install and easy to change out the imagery. Will be ordering more! So glad to hear it, Amanda! We'd love to see a photo of your exhibition set up if you have one! I have now purchased 6 of these large wall frames and they're great. They are easy to mount and easy to use as we are constantly switching out posters regarding any promotions that we are running in the company. I'm buying more frames today! Enjoy!